This is an act of self-vindication, an expression of Philip Roth's "continuing need for self-analysis and self-justification," a valiant defense of the naked and exposed "moral flank" some critics have found obscene. There's quite a lot of professorial hot wind blowing through these interviews (check out the one with Joyce Carol Oates), counterattacks and apologias explaining what is Swiftian, Rabelaisian or Kafkaesque about his masturbatory, mammary, baseball or political farces and also enough revelations about Roth's development, motives and imaginative modus operandi to refuel the controversy that's as old as Goodbye, Columbus. 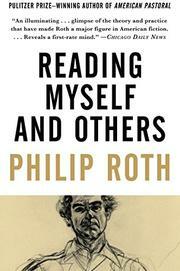 He contends his novels aren't at all autobiographical (Come, come now. . .). Still his own interpretation of Alex Portnoy as a "babbling sinner/showman seeking absolution/applause" has a certain pungency. Jumping off from Philip Rahv's stylistic paleface-redskin dichotomy, he explains what it is to be caught between two stools: he's a "redface." Here too are his responses to the Jewish critics who judged him not only tasteless, but--worse--anti-Semitic and self-hating, as well as some of his own pronouncements about Other Jewish Writers. Roth, with his '50's priestly literary education in Jamesian "moral seriousness" and "High Art" coupled with no small empathy for stand-up Jewish comics, keeps circling around the paradox in his conscience--some kind of causal relationship between over-scrupulousness and perversity. This time anyone can play Dr. Spielvogel.